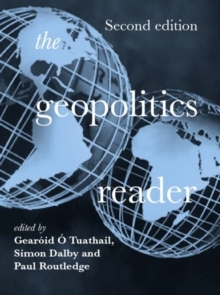 This extensively revised second edition of The Geopolitics Reader draws together the most influential and significant geopolitical readings from the last hundred years. A compendium of divergent viewpoints of global conflict and change, it includes readings from Halford Mackinder, Theodore Roosevelt, Adolf Hitler, George Kennan, Samuel Huntington, Edward Said, Osama Bin Laden and American neoconservatives. It draws on the most illuminating examples of imperial, Cold War and contemporary geopolitics, as well as new environmental themes, global dangers and multiple resistances to the practices of geopolitics. Whilst retaining a coherent five part structure, the selection of readings has been updated to account for recent developments in the critical study of geopolitics and the post 9/11 geopolitical landscape (including issues in technoscience, biowarfare, oil politics, and terrorism), and key questions address issues of the transformed nature of threats in the new millennium, the debate over the hegemonic position of the US, and non-American perspectives on contemporary geopolitics. Skilfully guiding the reader through the divergent viewpoints of global conflict and change, the editors, all leading geopolitical authorities, provide comprehensive introductions and critical commentaries at the start of each section. Illustrated with provocative cartoons, this second edition of The Geopolitics Reader is the ideal textbook for introductory classes on international relations, world politics, political geography and, of course, geopolitics, provoking lively discussion of how questions of discourse and power are at the centre of the critical study of geopolitics.